Uma received her Doctorate in dance(Aesthetics) from Mumbai University under the apt guidance of Padmabhushan Dr. (Smt) Kanak Rele. 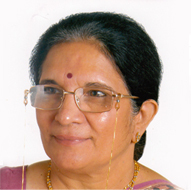 She has remained a Senior Research Fellow of the Department of Culture, Government of India. With a Master's degree in Literature and a natural flair for poetry and music, Uma exudes a unique dance philosophy that is reflected in her academic pursuits, choreographies and performances. As the former principal of J.G. College of Performing Arts affiliated to Gujarat University, Uma has the experience of establishing and heading a fully fledged degree college of dance, music and theatre. Having performed and taught Bharatanatyam in Mumbai, Chicago and in Ahmedabad, where she now resides, Uma has organized and conducted workshops for dance teachers from all over Gujarat in theory and practice of relevant topics. She has researched and presented papers and written articles on subjects relevant to dance and has published a book in Gujarati on Aesthetics with the support of Gujarat State Sahitya Akademi. Uma is a recipient of the highest State Award, the Gaurav Puraskar from the Gujarat State Sangeet Natak Akademi for the year 2001-2002. She has also been honoured by the Ahmedabad Municipal Corporation in 2013 for her outstanding services in the field of culture. She continues to render her services as a choreographer and show director for major events like 'Vibrant Gujarat' and 'Rannotsav' organized by the Government of Gujarat. She combines all virtues of a scholar, educator, choreogapher and a performing artist. 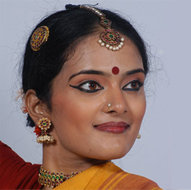 Shivangee has a Masters of Fine Arts (Bharatanatyam) degree from Nalanda Nrityakala Mahavidyalaya, Mumbai University with a Junior HRD scholarship from Ministry of Culture, Govt. of India. She is an ICCR empanelled artiste and is credited with many prestigious titles, such as 'Shingar Mani' Mumbai; 'Kal-ke kalakar', Gujarat; 'Nritya-Pratibha', Central Sangeet Natak Akademi, New Delhi. Shivangee has performed at national and international platforms like Natyanjali Festival, Chidambaram; Pallavotsavam, Mysore, Natarani Festival at Ahmedabad and also under the State and Central Government sponsored schemes. To hone her skills she has participated in several national & international workshops conducted by renowned artistes & choreographers. Presently she teaches dance at Gujarat University at diploma, degree, and post-graduate level and is also Academic Counsellor for IGNOU’s Bharatanatyam certificate course.